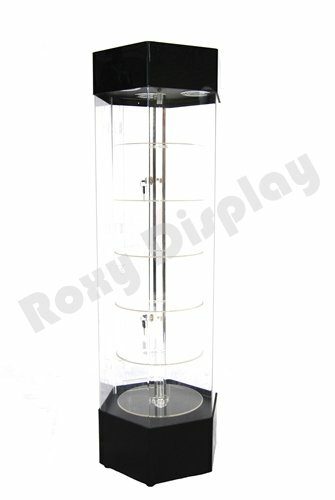 Rotatable Hexagon Acrylic Display Tower Case Dimensions: 13.8"Wx12"Dx42.5"H Hexagon side length:7'' Shelf Clearance:5.4'' Small items display case with built in LED lights at top, and door lock.Assembled. Material: Acrylic plastic Color: Clear with black top and bottom. PS: Accessories are not included. Color: Clear with grey top and bottom. Small items display case with built in LED lights at top, and door lock.Assembled. Material: Acrylic plastic Color: Clear with black top and bottom. If you have any questions about this product by ROXYDISPLAY™, contact us by completing and submitting the form below. If you are looking for a specif part number, please include it with your message.